Found one file extension association related to Interstate '76 and 1 file format developed specifically for use with Interstate '76. The game is set in the south-western United States of America in an alternative version of the year 1976, during a prolonged oil crisis. The game is based on the engine used for Activision's MechWarrior 2: 31st Century Combat, and requires a fair amount of strategy through the course of the game, as the player must balance the vehicle's armor and weapon load-outs appropriately in order to successfully complete the various missions. In the game's story mode, the player must also manage and repair equipment salvaged from the wrecks of opponents. There are four play modes available in the game: the "T.R.I.P." (an acronym for "Total Recreational Interactive Production"), which follows the game's protagonists in an episodic story; "Multi Melee", an on-line deathmatch version of the game; "Auto Melee", a deathmatch with computer-driven cars; and "Scenarios", short free-standing adventures featuring the game's protagonists. 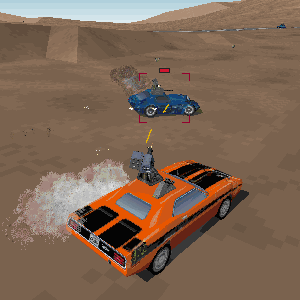 The primary difference between the scenarios and the T.R.I.P., length of play aside, is that the player has a much broader choice of vehicles in the scenario mode, while the player is limited to only one car during most of the T.R.I.P. mode. The game's vehicles are faithful reproductions of various cars and trucks from the era, both in appearance and driving characteristics, though the names have been changed. If you need more information please contact the developers of Interstate '76 (Activision), or check out their product website.